Scene Visa card login: check your balance online or by phone? I have a Scotiabank Scene VISA credit card, but I am not a client of Scotiabank per say. I mean, I do not have a checking/saving account with this bank. The only thing that I have with Scotiabank is the Scene VISA card. When I first got this card, I was checking out the balance by phone. It was relatively easy to check the outstanding balance over the phone, but it was painful to perform other actions like listing past transactions. (There’s a section at the end of this post explaining how to consult the balance by phone). Thankfully there’s a simple way to do this. 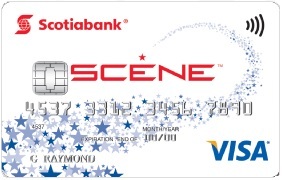 You can sign in to Scotiabank online and mobile services using your Scene Visa card. In that page, you need to click the Activate Now button in order to enable these services. If for any reason you have an issue when doing the activation online, then you will have to go to a Scotiabank branch and ask for help. It matters not that you aren’t a client of Scotiabank; if you have a Scene Visa card they will help you out. An important tip: if in addition to your Scene Visa card you have a ScotiaCard, then you will have to activate the services using the ScotiaCard, NOT your Scene Visa card. On the other hand, if you ONLY have a Scene Visa credit card, then you can use it directly to activate the online and mobile services. I don’t know why the guys at Scotiabank did this process so confusing; but that’s how it is. 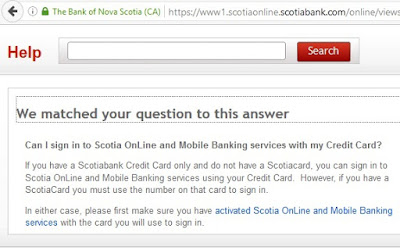 See the following images from the FAQ section at Scotiabank. Can I sign in to Scotia OnLine and Mobile Banking services with my Credit Card? Scotiabank - How do I register for online and mobile banking services? That is all! I hope the post was useful :-) If it was, please show your appreciation clicking the Google+ button at the beginning of this post. The easiest way that I have found is to call the number in the back of your card. You will be calling an automated system, so a machine will be doing the talking to you.The number that appears in the back of my card is 1-800-387-6556 (for US/Canada calls). I guess you can use this number as well. You simply have to enter your credit card number (16 digits in the front of your card) and home telephone number (10 digits) so that the system can authenticate you. After this you just have to pick the proper option from the possibilities you are given. Don’t worry, it’s straightforward. Just make sure to select the option that allows you to inquire your balance. In addition, you can request the list of transaction since your last statement. Again, a machine will be doing the talking and providing you with the transactions. That’s it! You can get this done from your phone in 5 minutes. No need to talk to an agent and the system is available 24 hours a day, 7 days of the week. If you found this information helpful, I would appreciate if you click the Google+ button at the beginning of this post. If you know other ways to check the Scotiabank Scene VISA credit card balance, share it with us in the comments section below. Thanks! i also don't have scotiabank account but i have its scene visa card. So does anybody know how to pay credit card balance using cash? Can i just deposit credit balance by inserting it into ABM machine.? If so, how do we pay exact change money, does machine accept coin. Suppose if i have to pay 250.50, i will pay 250 cash and rest 50 cent by coin money. The interest free grace period is calculated from the last date included in your statement, NOT from the date of purchase. See this page: http://www.fcac-acfc.gc.ca/eng/resources/publications/yourRights/Pages/CreditCa-Lescarte-2.aspx.